TUA’s work in helping Golf taxpayers oppose a property-tax-increase referendum was featured in the Morton Grove Champion. Officials in Golf Elementary School District 67 are taking a restrained approach to this month’s tax hike referendum, relying on information they provided during two previous failed votes to get supporters to the polls. The referendum, which would allow the district to increase the property tax levy beyond what is permitted by the Cook County Tax Cap, will appear on the Feb. 26 primary ballot. The only other measure on the ballot that day is a primary race for the Action Party candidate for mayor of Morton Grove. An identical request was defeated in November, and last March voters turned down a more traditional referendum seeking an increase in the maximum tax rate in the District 67 education fund. All of the measures would increase property tax revenue by about $1.14 million a year. The issue on the primary ballot will give the district the authority to increase the levy by 16.3 percent, 13.3 percent more than is permitted under the tax cap. The cap limits the levy increase without referendum approval to the Consumer Price Index or 5 percent, whichever is less. The district recently sent out an issue of “Chalkboard,” its newsletter, with information about the referendum. But unlike the previous two attempts, there are no public meetings or open house events scheduled to provide information on the measure to district residents. District 67 School Board President Meryl Gale said the district held several informational meetings before both of the previous two votes, and nothing has really changed since then. Superintendent Jamie Reilly noted that only a handful of people showed up at the last open house sessions the district held prior to the November vote. A parents group that was active promoting the referendum prior to the November vote, Kids 67, has also been quiet prior to the February vote. A spokesman for the group could not be reached for comment, but the group’s web site has not been updated since the November referendum and makes no mention of the February vote. One thing that is different this time is the interest of Chicago-based Taxpayers United of America, which sent out a press release Feb. 7 encouraging residents to vote against the referendum. The release contends that the money from a tax hike will go toward teacher and administrator salaries. During the past couple of years administrators have had their salaries frozen, and teachers have made contract concessions including a salary freeze because of the district’s financial problems. The Taxpayers United release says that the increased revenue from a tax hike will go toward those salaries, but the district says they plan to use the money to restore programs cut in an effort to reduce expenses such as such as all-day kindergarten. The release also cites the pensions of former Superintendent Harry Trumfio, who left District 67 in 1992, and Linda Marks, who retired in 2007. Despite the assertions in the release of “greedy” teachers and administrators, Reilly noted that his superintendent’s salary is the lowest among his peers in Niles Township and the second-lowest in Cook County. Reilly said she is not overly concerned about the interest of TUA in the District 67 race since the district has already gotten out a large amount of information. She said this is also the first time the group has gotten involved in the recent District 67 referendums. “I guess I would be concerned it if was factual,” she said. Reilly and Gale said they are unsure whether having the measure on a ballot with just one other race will improve or reduce the odds of passage. As an alternative to the February referendum, the school board had considered waiting to ask voters for a tax hike until the April 2013 general election. But Reilly said at a meeting in December that because of a state law, an April referendum would have had to ask for an increase in the rate, rather than the actual levy. As a result, she said, the district could end up with less money than it needs due to declines in the equalized assessed valuation of property in District 67. In March, a measure asking voters to increase the maximum tax rate by 0.342 percent to $2.401 per $100 of equalized assessed valuation was defeated by 112 votes. The reworded November referendum, asking voters to allow the district to increase the levy by 16.3 percent, was defeated by about 20 percentage points. After the March 2012 defeat of the tax hike, the school board adopted new and higher fees for extracurricular and athletic programs. The district also froze salaries for administrators and certified employees and eliminated early and late bus runs. 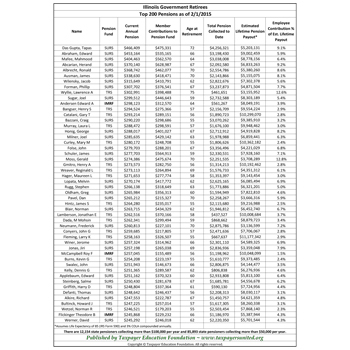 This article has been corrected from a version that originally appeared online and in print to reflect that District 67 Superintendent Jamie Reilly’s salary is the lowest among Superintendents in Niles Township and second-lowest in Cook County, not teachers in the district as a whole.